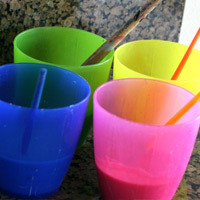 This paint is very easy to make. 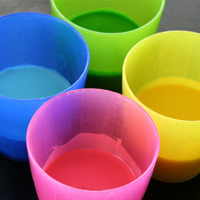 Just blend flour, water, and food coloring. My kids love it because they can choose their own colors. I love it because I don't have to worry when my two year old decides to eat it instead of paint with it! Be sure to clean the brushes right after using them. The flour in the paint makes them difficult to clean. 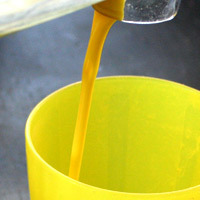 In a blender add 1/4 c water, 1/4 c flour and a few drops of food coloring. Blend well. Transfer to a cup. Rinse blender and repeat with remaining colors. 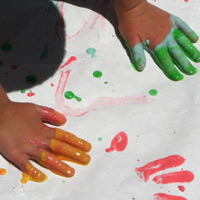 Great as finger paint or with paintbrushes. Have fun! 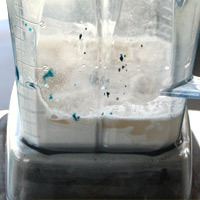 In a blender add 1/4 c water, 1/4 c flour and a few drops of food coloring. Blend well. Transfer to a cup. Rinse blender and repeat with remaining colors. 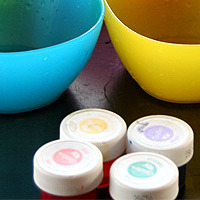 Great as finger paint or with paintbrushes. Have fun!